Last Revised on January 28, 2009. PLEASE READ THIS AGREEMENT CAREFULLY BEFORE USING THIS WEB SITE. You represent and warrant that you are at least 18 years old. TriVita&rsquos;s products may only be purchased and shipped within the United States and Canada. If you choose to access this Web Site from locations outside of the United States and Canada, you are responsible for compliance with local laws if, and to the extent that, such local laws are applicable. We reserve the right, in our sole discretion, to limit the availability of the Web Site to any person, geographic area or jurisdiction at any time. At TriVita, we stand behind the quality of our products. If you are not fully satisfied with your purchase, you will receive a full refund less shipping within 60 days of the order date. Please call our toll free number for complete details at 1-877-850-2968, to receive instructions for returning products for a refund. We are committed to keeping your e-mail address confidential. TriVita does not sell, rent, or share our e-mail lists with third parties. In addition, TriVita does not collect, sell or share the email addresses of the people to whom you forward emails or web sites. At any time, a member may choose to opt out from receiving e-mails by clicking on the opt-out link provided at the bottom of each e-mail, or by calling our Member Service Department at 1-800-991-7116. You may not link to this Web Site, or “frame,” or “mirror” this Web Site without obtaining written permission from TriVita. You may not link to TriVita&rsquos;s Web Site from any other web site, web page, content or advertisement that makes any claims as to the curative or health enhancing qualities of any substance. In an attempt to provide increased value to our visitors, TriVita may choose various third party web sites to link to from TriVita&rsquos;s Web Site. However, even if the third party is affiliated with TriVita, TriVita has no control over these linked sites, each of which may (or may not) have their own policies and practices in place. TriVita has no responsibility or liability whatsoever for the content, actions or policies of third-party web sites. The inclusion of third-party web sites on our Web Site in no way constitutes an endorsement of such web site’s content, actions or policies. These linked sites are for your convenience and you access them at your own risk. Copyright, Trademark & Other Intellectual Property Rights. All of the content you see on this Web Site, including, for example, all of the pages, page headers, images, illustrations, graphics, audio clips, video clips, software, content and text (collectively defined as “Content”), is subject to trademark, service mark, trade dress, copyright and/or other intellectual property rights or licenses held by TriVita, one of its affiliates or by third parties who have licensed their materials to TriVita. The entire Content of the Web Site is registered as a collective work under U.S. copyright laws, and TriVita owns a copyright in the selection, coordination, arrangement and enhancement of the Content. TriVita also owns a copyright or a license to all individual items of Content. Do not modify or alter the Content in any way, or delete or change any copyright or trademark notice. TriVita reserves complete title and full intellectual property rights in any Content you download from this Web site. This Web Site, including all Content, is intended solely for personal, noncommercial use. Commercial entities do not have permission to download, view, display, copy or store any Content. This Web Site, including all Content, may not be used, displayed, viewed, copied, reproduced, distributed, republished, uploaded, downloaded, posted, transmitted, mirrored, modified, or otherwise for commercial purposes or for personal financial gain. You may not redistribute, sell, translate, modify, reverse-engineer or reverse-compile or decompile, disassemble or make derivative works of this Web Site or any Content or components that are available on this Web Site. Except as noted above, you may not copy, upload, download, reproduce, modify, publish, distribute, transmit, transfer or create derivative works from the Content without first obtaining written permission from TriVita. We welcome your comments. However, any comments, feedback, notes, messages, ideas, suggestions or other communications (collectively, “Comment&srdquo;) submitted to TriVita through trivita.com or otherwise, shall be and remain the exclusive property of TriVita. Your submission of any such Comments shall constitute an assignment to TriVita of all worldwide rights, title and interest in all copyrights and other intellectual property rights in the Comments. TriVita will be entitled to use, reproduce, disclose, publish and distribute any material you submit for any purpose whatsoever, without restriction and without compensating you in any way. For this reason, we ask that you not send us any Comments that you do not wish to assign to us, including any confidential information or any original creative materials such as stories, product ideas, computer code or original artwork. You agree that you will not violate or infringe the rights of any parties, including privacy, publicity and intellectual property and proprietary rights, such as copyright and trademark. Before submitting any materials to TriVita, please ensure that you have obtained copyright and other permission to post such materials and to permit TriVita to use such material without restriction. The testimonials on our Web Site reflect the actual experience of each individual, are anecdotal only, and may be atypical. The Web Site is provided on an “as is” and “as available” basis. We disclaim all warranties of any kind, whether expressed or implied, including without limitation warranties of title, security, accuracy, non-infringement, and implied warranties of merchantability or fitness for a particular purpose, except as expressly noted in the section of this Agreement entitled Customer Satisfaction Guarantee. We do not make any warranty that (i) the Web Site will meet your requirements; (ii) the Web Site will be uninterrupted, timely, secure or error-free; or (iii) the results that may be obtained from the use of the Web Site will be accurate or reliable. Your use of this Web Site is at your sole risk. TriVita shall not be liable for any damages of any kind related to your use of this Web Site, including loss of data. Although we have taken reasonable steps to prevent the introduction of viruses and other destructive materials to this Web Site, we do not guarantee or warrant that this Web Site or materials that may be downloaded from this Web Site do not contain such destructive features. We are not liable for any damages or harm attributable to the foregoing. Advice, opinions and statements should not be relied upon when making important personal, medical, legal or financial decisions. You should consult a healthcare professional to obtain specific advice appropriate to your circumstances. YOU AGREE THAT TRIVITA, ITS EMPLOYEES, AFFILIATES, AGENTS, INDEPENDENT CONTRACTORS, REPRESENTATIVES AND THEIR RESPECTIVE OFFICERS OR DIRECTORS, SHALL NOT BE HELD LIABLE FOR ANY CLAIM, LOSS, DAMAGES, EXPENSES OR COSTS WHETHER DIRECT OR INDIRECT, INCLUDING CONSEQUENTIAL OR SPECIAL DAMAGES, LOST PROFITS OR OTHERWISE, ARISING OUT OF OR RELATING IN ANY WAY TO THIS AGREEMENT, THIS WEB SITE, YOUR USE OR INABILITY TO USE THIS WEB SITE, YOUR PURCHASE OR USE OF ANY GOODS, SERVICES OR INFORMATION FROM THIS WEB SITE, OR FROM UNAUTHORIZED ACCESS TO OR ALTERATION OF YOUR TRANSMISSIONS OR DATA OR THE ACTS OF ANY THIRD PARTY RELATED TO THE WEB SITE. YOU HEREBY WAIVE ANY CLAIMS WITH RESPECT THERETO, WHETHER BASED ON CONTRACTUAL, TORT OR OTHER GROUNDS, EVEN IF WE HAVE BEEN ADVISED OF THE POSSIBILITY OF SUCH DAMAGES. SOME JURISDICTIONS DO NOT ALLOW FOR LIMITED LIABILITY OR EXCLUSION OF IMPLIED WARRANTIES, SO NOT ALL OF THE ABOVE LIMITATIONS MAY APPLY TO YOU. Your violation of the rights of any party, including without limitation any claims of libel, defamation, violation of rights of privacy or publicity, misappropriation or trespass. TriVita Gift Card Terms & Conditions. TriVita Gift Cards can be issued for the following amounts: $25, $50, $75, and $100. Each Gift Card is sent with a Gift Card Carrier, in a Gift Card envelope along with a current TriVita catalog and an invoice that includes an optional gift message. The TriVita Gift Card is good for any TriVita product or service but may not be used to purchase a Gift of Health. It is non-refundable and not redeemable for cash. This Gift Card is subject to local, governmental and TriVita current terms. There is no expiration date for this Gift Card. Coupons, discounts and VitaPoints cannot be applied towards the purchase of a Gift Card. If products are included in your Gift Card order, the discount value will only apply to non-gift card product items. A Gift Card(s) purchase does not count toward the minimum order value required for promotional offers. Sales tax will not be applied during the purchase of the actual Gift Card. If products are included in the order, tax will only apply to products. A Gift Card will only work in the country for which it was issued. A card shipped within the US with US denominated funds will only be valid for purchases made within the US. A card shipped to Canada with Canadian denominated funds will only be valid for purchases made within Canada. VitaPoints will be assigned to the person who redeems the Gift Card. 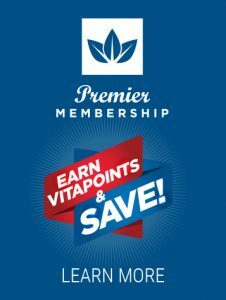 No VitaPoints will be earned during the purchase of the Gift Card. The value of this card will not be replaced if the card is lost or stolen. For balance information call 1-800-991-7116.